While plucking jasmine flowers today morning, I was really captivated by the beauty of the small plant laden with white flowers spreading the heavenly scent all around. It got me into a pensive mood. 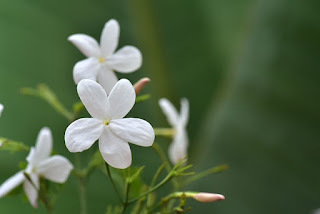 The plant with brown stem and green leaves has snow white flowers at the tip if its branches. My head bowed in reverence to the great creator who has spread such beauty around me. How blessed I felt at the moment! I have been watering the plant with great love, but I couldnt have induced the plant to produce the flowers. Patient waiting only brought this result. If I had become impatient and stopped watering the plant, it would have simply died. Many of the lifes situations are also like this. We have to just keep on doing what is needed to realize our dreams and when the suitable time comes, the wonderful results have to just materialize! Getting impatient or stopping our efforts will only lead to disappointment and frustration. We should learn to let ourselves loose and just enjoy doing the task at any given moment. The secret of remaining rooted in happiness while living in this world of strife and chaos is that- letting yourself loose! Just as you can float in water by just leaving the body loose, you can float in happiness during your daily activities, and each day will be a day to celebrate!